Party in the USA. By David McGee. Based in part on the life of Joshua William Gelb. Presented by Incubator Arts Project, 2013. Directed by Joshua William Gelb. Ed Fringe. Johnny Gasper, Laura Moss and Wil Petre. Photograph by Richard Davenport. Ed Fringe. Johnny Gasper, Eric Clem, Laura Moss and Anthony Mattana. Photograph by Richard Davenport. Ed Fringe. Jessie Shelton, Molly McAdoo, Eric Clem, and David McGee. Photograph by Richard Davenport. Anthony Mattana. Photograph by Richard Davenport. Ed Fringe. Johnny Gasper, Eric Clem, Jessie Shelton, David McGee, and Molly McAdoo. Photograph by Richard Davenport. Ed Fringe. Johnny Gasper, Jessie Shelton, Eric Clem, and Molly McAdoo. Photograph by Richard Davenport. “Forceful, intelligent, theatrically ambitious and a sharp assault on the absurdities of the American dream." "The cast is brilliant, the definition of dynamism." This is a true story. Back in the fall of 2008 I temped for Deutsche Bank. I was working for a law firm that had been tasked with sorting through the e-mails of the bank’s subprime mortgage division. It was my job, along with 20-30 other paralegal temps, to sit around a large conference table covered in old PC’s and sort through thousands upon thousands of emails, meticulously looking for keywords that could, on the off-chance of litigation, infer that Deutsche Bank had been knowingly securitizing high-risk mortgages at the expense of debt-ridden homeowners. I was getting 20 dollars an hour, 12 hours a day, to search for potentially incriminating evidence, while the rest of the country teetered, quite oblivious, on the precipice of what would soon be called the Great Recession. This is also a true story: The very week that Lehman Brothers folded, I dropped acid for the first time and happened to spend a long night in the penthouse suite of the Plaza Hotel, which I had broken into with a con-man associate (If you don’t believe me, I still have an artificial oil painting and a gold plated shower-head to prove it). The next morning I woke up, head throbbing from the drugs still coursing through my system, and went back to work for another 12 hours. When the recession ultimately hit I did what most young artists did: I applied to graduate school and hoped that in the intervening years things would get better. Four years later, however, that wasn’t the case. I struggled to understand the densely abstract concepts behind the banking crisis and its impact both on the current economy as well as my generation’s future financial stability. I grappled with an obscure form of guilt, wondering if someone as tangentially involved as I could somehow consider themselves responsible for the entire mess. Inspired by the rhetoric of the Occupy Movement, I approached playwright and satirist Dave McGee about collaborating on an autobiographical theater piece that would engage with the complexities of modern economics in the form of a surreal, picaresque comedy. Based in part on my experiences at Deutsche Bank, Dave created a madcap farce about a world on the brink of economic collapse and the guy named Jeff who must save it. A jobless, disaffected 20-something, Jeff is temporarily employed by a financial giant to maybe cover up evidence documenting their involvement in the imminent mortgage crisis. Fueled by little more than some acid and the recently released brand of Bud Light Lime, Jeff and his friends fall screaming into the maw of the Great Recession, traveling from the penthouse of the Plaza Hotel to a German anarchist squat on Kaiserwilhelmstrasse to the steps of the US Capitol. Strudel is baked and devoured. Russian folktales are enacted. Economic strategies are debated. Time is non-linear. More strudel is baked. Party in the USA was first presented at the Incubator Arts Project, 2013. Produced by Taylor Edelhart. Choreography by Katie Rose McLaughlin. Scenic Design by Patrick Rizzotti. Video Design by Bart Cortright. Sound Design by Anthony Mattana. Lighting Design by Josh Smith. Featuring Eric Clem, Johnny Gasper, Molly McAdoo, Laura Moss, Caleb Hammons, Wil Petre and Jessie Shelton. 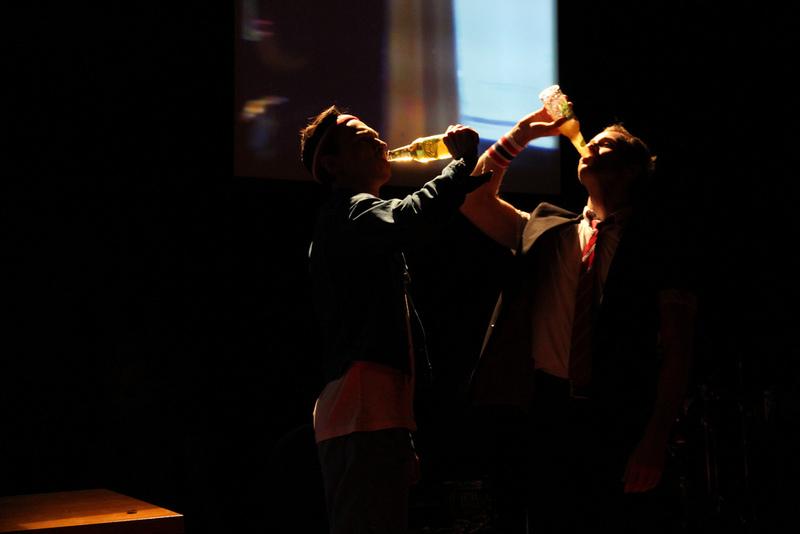 In August 2014 a revised version of Party in the USA was featured at the Edinburgh International Fringe Festival at the Underbelly's Topside Theater. Produced by Lucy Jackson and Taylor Edelhart. Choreography by Katie Rose McLaughlin. Scenic Design by Patrick Rizzotti. Video Design by Bart Cortright. Sound Design by Anthony Mattana. Costume Design by Sylvianne Shurman. Lighting Design by Josh Smith. Featuring Eric Clem, Johnny Gasper, Molly McAdoo, David McGee, Laura Moss, Wil Petre and Jessie Shelton.